I am delighted to announce the publication of my book Office 365 Essentials. This book starts with an introduction to Office 365 and its fundamentals. We then move onto workload management and deployment. You will delve into identities, authentications, and managing Office 365. We also cover concepts such as collaboration with Microsoft Teams, and tools such as Delve and Skype for collaboration. Toward the end of the book, you’ll master monitoring and security concepts. By the end of this book, you will have hands-on experience working with Office 365 and its collaboration tools and services. This book is designed for readers who have a fundamental understanding of Office 365 services, but might not have technical expertise in the administration and configuration of the on-premises technologies equivalent to those services like Exchange, SharePoint, Office and Skype for Business. Office 365 has various technologies and this book assumes that the audience for each of these technologies has the relevant expertise to administer and change some configurations on those workloads. This book includes information that can serve multiple audiences and roles, such as information on how to implement the fundamental workloads in areas like migration plan, identity plan, network assessments and security. The audience must have some operational expertise for managing AD, running network assessments, and making configuration changes like Domain Name System (DNS), proxies, and firewalls. Is not required but is advised in all implementations to have a separate environment to test in lab and to implement the topics covered in this book. I have authored this book during a couple of months and will try to constantly update its content to keep up with the changes in Office 365, including changes of the services as well as screenshots. Some of the information presented in this book may have some differences when compared with your environment and what features are available at the time you are reading. Authoring a technical book is challenging, especially when it covers a new technology that is rapidly changing every week with hundreds of changes each year, as is the case with Office 365. After reading this book, I hope that you can appreciate how an implementation of Office 365 is done. There are several people who have made this project possible. First, the publisher for the opportunity to author this book. I would also like to thank Devika Battike, the editor, for his patience and valuable guidance throughout the project; Prateek Bharadwaj, the acquisition editor that make this project go live and all the Packt Publishing Limited Team that contributed hard to make this book a reality. I would like to thank all our technical reviewers and subject matter experts who, behind the scenes, validated all the material and provided particularly important feedback and corrections. They are André Vala and Tiago Costa, both Office Servers and Services MVPs from Portugal and Mark Dunkerley from Orlando, Florida USA. Some quotes and phrases from André Vala and Tiago Costa that put a huge effort reviewing this book. André Vala said “Office 365 is a very large and complex topic, given the huge amount of services and features included in it. 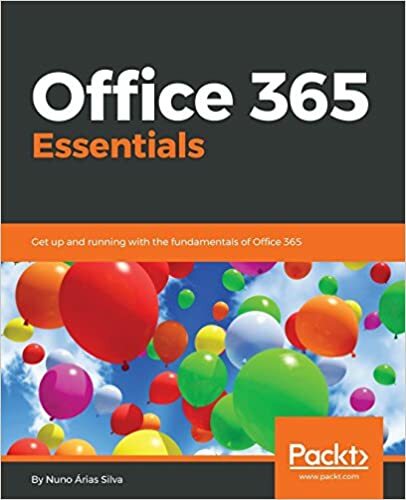 Many books have been published on specific components of Office 365, most of them too complex and dense for someone just starting with the deployment or just wanting to get a grasp on the product. I would like to thank all my colleagues, partners, customers and Microsoft who helped this book happen, to GFI, where I work, and all the customers with which I have done projects in last 8 years since the birth of this cloud service. They gave me the experience to author this book and to continue learning in each project. IT leaders and technical experts in other organizations who have shared their experience with me and gave me the opportunity to work on their Office 365 projects. And finally, my Family that gave me strength, support and time to author this book in the past months.